Jigsaw Jumble is a Free-for-All minigame featured in Mario Party 9, and returns in Mario Party: The Top 100. The first puzzle is already in front of the player. The possible pieces to complete it then fall from above. 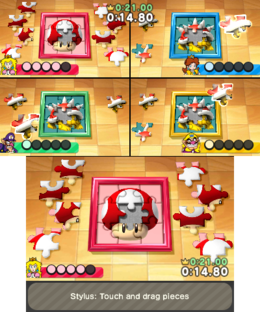 Players have to select the missing puzzle piece to complete puzzles, until all five puzzles are solved. For every round, the number of choices increases by one, starting with four. If the player selects an incorrect piece, it simply flies away. The puzzle pictures are: Bob-omb, Boo, Buzzy Beetle, Chain Chomp, Cheep-Cheep, Fire Flower, Spiny, Green Shell and Mushroom. The initial record time for this minigame is 30 seconds. The player who completes the puzzles fastest gets a golden frame for the last puzzle. Second place gets a silver frame, and third gets a bronze frame. If the player in last place manages to complete their puzzle immediately after the second last player has finished theirs, the player in last will receive a green frame, otherwise, no frame will be given. "Point the Wii Remote at the piece you want to take, and press and hold . While still holding , move the piece to the missing area and release ." Rules – "Find the missing pieces in each of the five puzzles. Be the first to complete them all to win!" Description – "Find and place the right pieces to be the first to finish 5 puzzles!" On-screen – "Place the right pieces!" This page was last edited on January 2, 2019, at 12:24.